This node creates a mask from the angles of a terrain. The mask created has the same size and resolution as the input terrain. To add a Mask from angles node, right click in the Graph Editor and select Create Node > Mask Generation > Mask from angles. 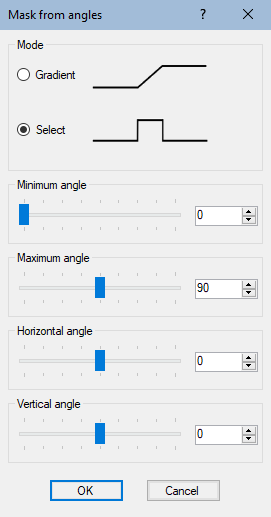 Two modes exist to edit the Mask from angles node. At each vertex, the mask has a value of 0 (black color) if the angle of the terrain is less than or equal to the minimum terrain angle; it has a value of 1 (white color) if the terrain angle is higher or equal to the maximum angle; it has a value between 0 and 1 if the terrain angle lies between these two angles. The Minimum and Maximum angles define the interval to select. Select mode: At each vertex, the mask has a value of 1 (white color) if the terrain angle is between the Maximum angle and the Minimum angle; otherwise, the mask is set to 0 (black color). The range is set manually.